B1609. GIACOMO LAURI-VOLPI. 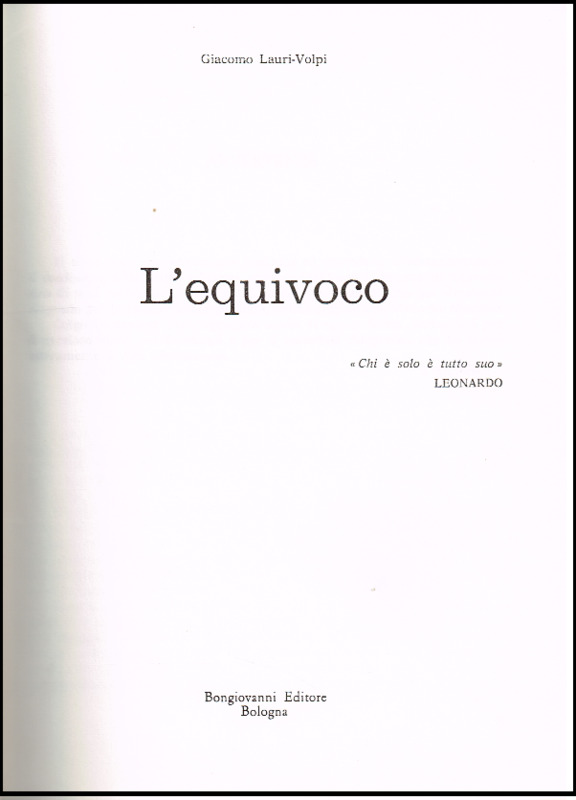 L'Equivoco (Reminiscences) (Revised Edition). Bologna, Bongiovanni, 1979. 265pp. Photos. (Italian Text) (Pictorial thick paper covers) Very long out-of-print, Final Copy! Following studies at Rome's Accademia di Santa Cecilia with Enrico Rosati and Antonio Cotogni, Lauri-Volpi made his stage début in Viterbo in the rôle of Arturo in Bellini's I PURITANI. 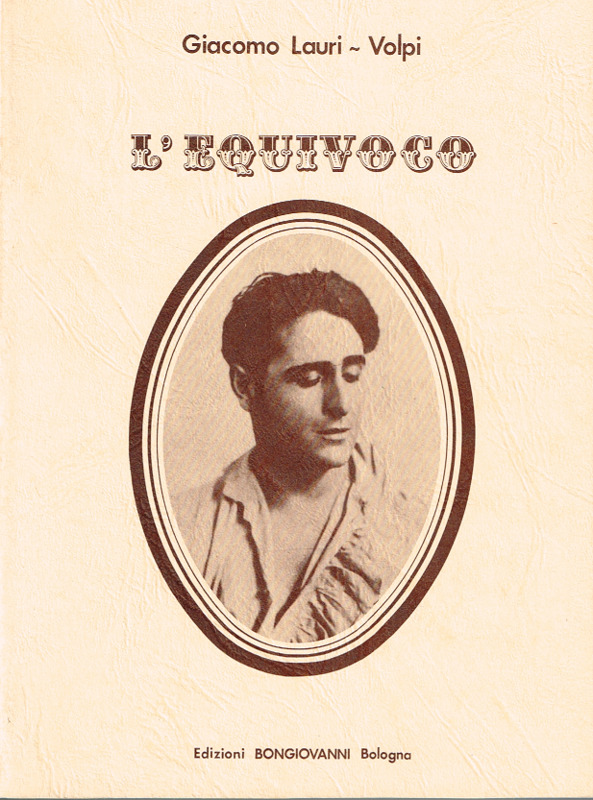 He sang that 1919 production under the name of Giacomo Rubini. The following year, he introduced himself to Rome, singing the rôle of Des Grieux in Massenet's MANON (opposite the famous Rosina Storchio), now as Giacomo Lauri-Volpi. His La Scala début came in 1922 as the Duke and he remained an important singer there throughout the 1920s and 1930s. Lauri-Volpi first appeared at the Metropolitan Opera on 26 January, 1923, as the Duke, opening a decade-long relationship with that house singing, among other rôles, the first American performance of Rodolfo in Verdi's LUISA MILLER. He sang in the 16 November, 1926, American première of TURANDOT, Calaf being a perfect match for his firm legato and brilliant top notes. The tenor's début had brought a positive verdict from veteran critic W.J. Henderson who deemed his voice of ‘excellent quality’, but questionable health held more comprehensive evaluation at bay. Subsequent seasons brought a greater appreciation of his gifts, although he never won the level of acclaim that greeted him in his native country. At the end of the 1932-1933 season, he was not re-engaged due to a salary dispute because of the Great Depression. The tenor's début at Covent Garden in 1925 as Andrea Chénier found the tenor's ‘top notes and Italian vulgarities’ pleasing those in the gallery but not many others. Apparent fee problems kept Lauri-Volpi away from London until 1936, when he returned as the Duke in RIGOLETTO and refused, perhaps because of a tepid reception, to take even a single curtain call. As Radames and Cavaradossi, the tenor had better fortune, being well-received in both rôles and, in the latter, showing his ability to out-sing a too-loud orchestra. His high fees, however, precluded a re-engagement. Seasons at Paris and at the Teatro Colón in Buenos Aires brought generally positive reviews. Among honors in Italy were his assignment of the title rôle in Boito's NERONE to open the Teatro dell'Opera in Rome in 1928 and his engagement for the rôle of Arnold in La Scala's centenary mounting of GUILLAUME TELL. From the mid-1930s on, Lauri-Volpi's performances took place primarily in Italy and Spain. Although he retired at 67, he occasionally appeared at public occasions to sing an aria or two, most notably at Barcelona when, at age 80, he sang ‘Nessun dorma’ from TURANDOT. "Lauri Volpi was a highly cultivated, deeply religious man. He shunned publicity in every form and—unfortunately for us—hated making records. He was fundamentally a timid man, but had to be aggressive in order to survive in the cynical operatic environment….Lauri Volpi and Maria Jeritza premiered TURANDOT at the Met on 16 November 1926. On the opening night, Lauri-Volpi noticed that the public remained unresponsive to the aria ‘Nessun Dorma’, as Puccini had written it; that is, without the ‘corona’ on the final high B. So, after getting Serafin's approval, the night of the second performance, Lauri-Volpi, for the first time in the history of TURANDOT, topped off the aria with a sustained high B which [made] the audience delirious. He can rightly be called the creator of the ‘Nessun Dorma’ as it is sung today." "...Giacomo Lauri-Volpi, a remarkable singer and a colourful character. In his long, contentious life he has become the most articulate of singers (the author of five books), watching over the Italian scene, and surviving long enough to have had the melancholy honour of composing obituaries for many of his former colleagues....the one who in Italy itself most successfully challenged the notion of Gigli as IL TENORE."